Leonardo’s Italian Bakery & Da Vinci’s Brick Oven Pizzeria - A true work of art in home-baked & traditional Italian flavors - Times Publishing Newspapers, Inc.
“Our passion is bringing you ‘old world traditional’ Italian favorites just like your grandma used to make,” said the owner, Angelo Affatato. Their traditional artisan bread is home-baked on the premises with a hard crust and made from scratch. They are known for wholesaling their breads out to 100 restaurants and stores. At their bakery/deli, you’ll find authentic Italian cakes, pastries, and so much more. Italian cannoli filled with ricotta cheese, tiramisu, Italian amaretti, typical Italian holiday pastries, strudel, cookies and biscotti, Italian merengues, pizzelles of different flavors, lobster tails filled with cream and jelly and so much more. Their large selection of meats and cheeses include prosciutto, soppressata, salami, pancetta, beef bologna; home-made turkey, roast beef and roast pork in different flavors; Parmigiano reggiano, Asiago of different ages, and countless others. 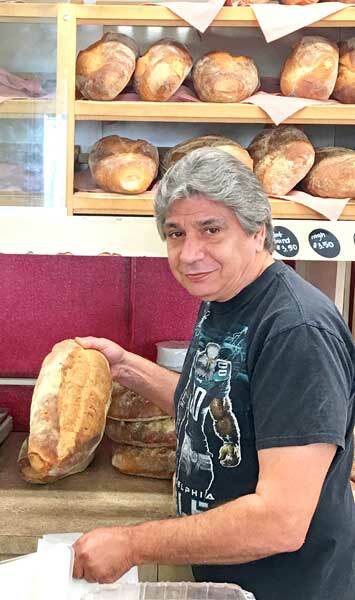 Leonardo’s bakery began in Philadelphia and moved to Feasterville in 2007. When they came to Feasterville, the traditional bakery expanded with Da Vinci’s Brick Oven Pizzeria. Located at 183 Bustleton Pike, Feasterville-Trevose, this family-run bakery and pizzeria combination is one you won’t find elsewhere, and you certainly won’t find a better taste. Not only do they have famous tomato pies to offer, but also they have other popular specialties including Margherita pizza with fresh mozzarella and basil, and white pizza with spinach, garlic and ricotta. Their delicious delicacies don’t end there – you’ll want to try their Italian hot roast sandwiches made with pork and beef and sharp provolone on their famous homemade rolls. Leonardo’s Italian Bakery & Da Vinci’s Pizza also offers corporate and private event catering with pizzas, sandwich trays, salads, platters, pastries and cookie trays. Don’t forget to order your holiday party trays to impress your family this season with the very best. You won’t find flavor like it elsewhere! Come out and enjoy their seating area when the weather is nice. His partner comes straight from Italy and you’ll find his children hand-making pizzas and breads in the bakery and pizzeria. Leonardo’s & Da Vinci’s is a true work of art, with highly dedicated staff and a welcoming atmosphere. Leonardo’s Bakery is closed Mondays and open from Tuesday to Saturday from 8:00am until 5:00pm and Sundays from 8:00am until 4:00pm. You can call the bakery at 215-357-0357. Da Vinci’s Pizzeria is closed Mondays and open from Tuesday to Thursday from 11:00am until 8:00pm; Fridays and Saturdays from 11:00am until 10:00pm; and on Sundays from 12:00pm until 8:00pm. Call the pizzeria at 215-357-0656. You can also visit them online at www.leonardositalianbakery.com for more information including menus of what they offer, a gallery of delicious foods, catering and information on wholesale for restaurants and food stores. Order online at Grubhub.com or Eat24.com – they deliver for a $10 minimum order.